*Since rumors of allegedly feuding “Idol” judges, Mariah Carey and Nicki Minaj, have surfaced, the show’s producers have spoken up about the issue, saying the reports aren’t all true. 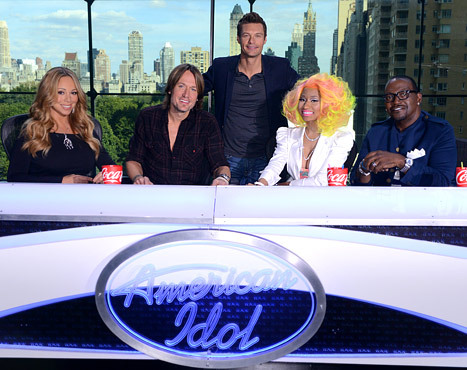 “This is one of the best, most passionate, dynamic and invested judging panels we’ve ever had,” producers said in a statement released to “Access Hollywood.” “We love and support all of the judges and the fantastic work they are doing, and we can’t imagine a better group to find the next ‘American Idol.’ Despite all the accusations and media speculation – much of which is inaccurate – production is going extremely well today and the judges are focused on finding the best talent here in Baton Rouge,” the statement concluded. So there you have it, the ladies aren’t having a cat fight… at least to the capacity that’s been reported. Nicki is talking to the media, so the producers are doing damage control. Nicki is NOWHERE near being a diva and there is NO comparison to Mariah, who is in a TIMELESS CLASS by hershelf. Nicki is only as HOT as the moment and her next hit, if there’s one. Her look is WACKED and clown-ish and OLD already. Mariah has NATURAL beauty at her age and after having twin babies…and can we say CLASSY. Of course they are “cleaning it up”….LOL…they got everybody’s attention to watch this upcoming season…..its called ratings. Don’t fall for the okie doke. It was all staged.